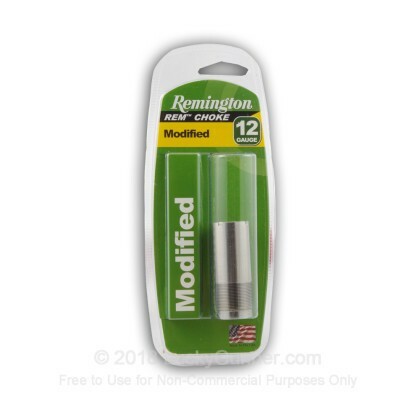 Remington shotgun chokes are a great way of increasing the versatility of your Remington 12 ga shotgun. By simply changing the choke, you can optimize the shot pattern of your shotgun to suit the shooting or hunting conditions. This Modified choke is used when you want a somewhat restricted pattern at distance for medium distance squirrel, bird, and rabbit hunting. The Remington choke tubes are constructed of the highest quality stainless steel giving excellent corrosion resistance. This choke is designed to meet the demands of both steel and lead shot, offering the shooter the widest selection of compatible ammunition.